Synopsis: From internationally bestselling author Monica McInerney comes a captivating and charming new novel of family secrets, the loyalty of sisters, and the power of redemption. As a child, Maggie Faraday grew up in a lively, unconventional household with her young mother, four very different aunts, and eccentric grandfather. With her mother often away, her aunts took turns looking after her until, just weeks before Maggie’s sixth birthday, a shocking event changed everything. Twenty years later, Maggie is living alone in New York City when she receives a surprise visit from her grandfather Leo, who brings a revelation and a proposition: He’s preparing a special gift for his daughters and needs Maggie’s help. When the Faradays gather from all parts of the world to celebrate Christmas in July;a longstanding tradition;Maggie uncovers unexpected family history and learns that the women she thought she knew so intimately all have something to hide. Written in McInerney’s trademark warm, heartfelt prose, The Faraday Girls is a sweeping and affecting family saga. Review: This is a beautifully executed story about five motherless sisters and their eccentric father. It highlights intergenerational relationships, attachments and traditions and the complexities of family. I was a little disappointed that the novel jumps from the Faraday sisters in their twenties to their forties and fifties because it stunted my connection with the characters. However, it did pick up where Maggie is in her mid-20s and she became the protagonist that I became emotionally connected to for the remainder of the story. It was interesting to observe her life from pre-birth to adulthood and the influences of her Aunts, grandfather and the grandmother she never met in her life. I felt frustrated for Maggie at times by the intrusiveness of her Aunts and their perceived claims on her life, but I also enjoyed the sense of belonging and adoration that she revels in with all these caring women in her life. 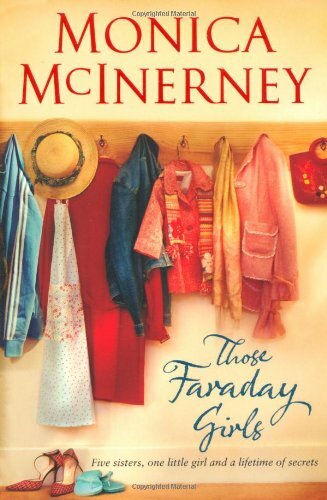 Monica McInerney does a wonderful job of creating a number of well-rounded characters in Those Faraday Girls in a similar style to Little Women and Pride and Prejudice. It felt like I was reading a classic. One of my favourite Aussie authors and I feel privileged that I recently visited her home town in the Clare Valley, South Australia (I fell in love with the place!). Sounds like an excellent book. Are you signed up for the Australian Women Writers 2012 Challenge? It would be great if you could link your review to the website. I most certainly am planning to sign up to the AWW challenge, just have to put my post together. Thanks for stopping by Elizabeth and best wishes for 2012! Thanks Shelleyrae, I haven’t read a book of Monica’s that I haven’t liked! Thanks for your comment Marion. I really enjoyed A Taste For It too and I recommend picking up another one of her titles. Thank you for a great review. I think I’m going to give this one a go. Thanks Lisa, it’s definitely one to add to your TBR shelf!